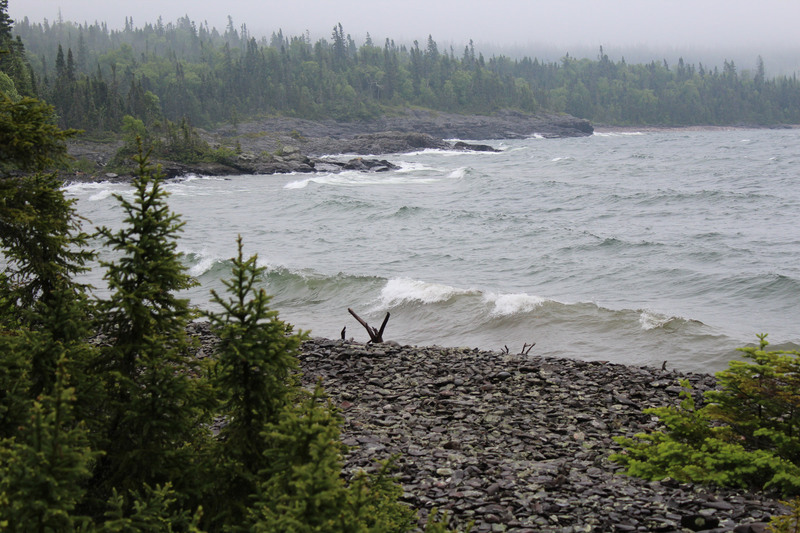 Sometimes Lake Superior feels like an inland sea, and sometimes, just a lake. In this muddy campsite, hemmed in tight by pines, maples, and birches, it felt like the northern Wisconsin lakes that Sophie and I had canoed when we were growing up. Superior is usually separated from the forest by yards of stones or sand, but today a thin, pebbly beach only a few feet wide separated our little clearing from the roiling lake. Paddling along the shore, we had seen a narrow gap in the trees and suspected it might be a pathway to a campsite. Beneath the tangle of undergrowth, clayey ground had turned soupy with mud. We found a little cleared patch in the woods with a stone fire ring and a few stumps for sitting. A short pathway led from the clearing down to the water. Sophie stretched out her back after the first day we had spent padding from breakfast until dinner. We bunked down here on a tiny spit of wooded land near the Brule River in Wisconsin. There was a rest area just through the trees, and we could hear cars occasionally whizzing by on the county road. This little beach’s wealth of firewood would have made a fantastic bonfire, but we intended to keep our presence under the radar. This meager clearing was where we would have to weather the first big storm of our 1,200-mile circumnavigation of Lake Superior. 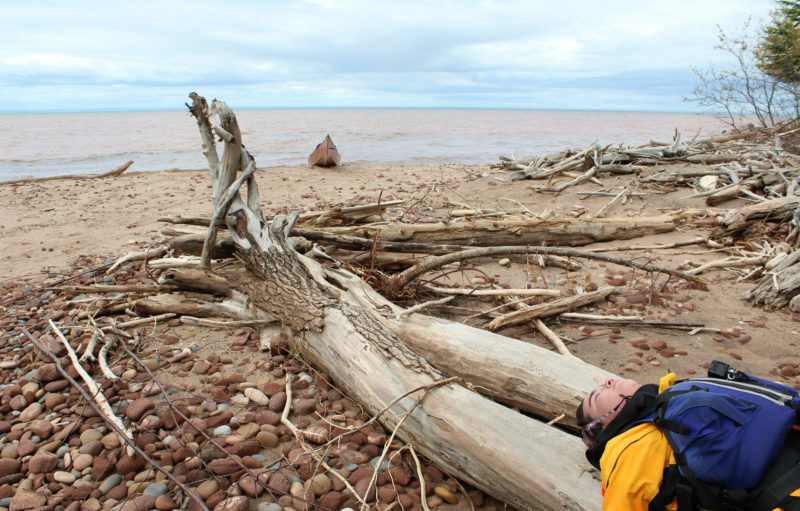 Sophie Goeks and I, like idiots, had set out on May 25, 2016, from Little Sand Bay on Wisconsin’s Bayfield Peninsula, only a week or two after the ice had cleared. We had finished our final papers and exams in college during the early days of May before putting in. Now, 10 days into this journey, we prepared for the windy hail and rain storm the weather report said was coming our way. We pulled in around 10 a.m., just before the weather got nasty. We set the tent up in the middle of the scrubby clearing and ate a few handfuls of fatty nuts before crawling into our sleeping bags in our tent to try to get warm. Temperatures were in the low 40s, and it had been drizzling since we retired to our tent—I was chilled to my core. I did a mid-morning slide onto a beach for break just outside of Port Wing, Wisconsin. The airy blue patches peering around the spring’s lurking thunderheads were a merciful break from May’s relentless thrashing. From one of the dry bags Soph pulled out one of the half dozen novels we had in our library. It was a battered romance novel featuring chefs at competing Italian and French restaurants who inevitably fall in love, and predictably, spatulas fly. Soph and I traded off reading aloud in half-hour segments. It was our version of watching soaps all day. Sophie waded her boat in ahead of surf to a thin strip of beach at Wisconsin Point. 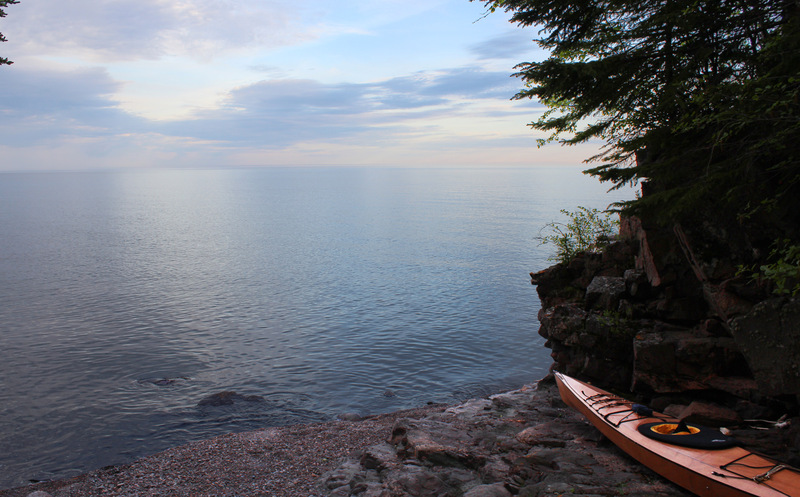 It was the last Wisconsin beach we could land on before passing Superior Entry Light, here in the distance just above the kayak’s bow, and entering Minnesota. The reddish hue of the water is our last reminder that we were still in Wisconsin—where the clay soil dissolves into the water. Around 2 p.m. we crawled out of the tent, Soph fired up the stove while I coaxed smoke from a smoldering pile of soggy sticks in the fire ring. With butter melting in the pan, Soph wrapped thick chunks of cheese and venison in tortillas and fried them in butter. I made peanut-butter and Nutella quesadillas to complement. Out in the cold, I had abandoned all of my nutritional standards. I knew we should have been eating a balanced diet with fibers, proteins, and complex carbs, not just fats, but it was body over mind, and my cravings had nothing to do with fruits or vegetables. Superior Entry Lighthouse marked our first border crossing of the trip—it became ceremony that occasions such as these were celebrated with a Snickers bar. In the background, a ship prepares to finish a journey to Duluth across the treacherous middle of the lake. We gorged ourselves, crawled into the tent only to emerge every two hours to repeat the process. I was so, so cold. I had only three pairs of wool socks to my name out here: one pair that I wore with my drysuit, now crusty with dried sweat, another one pair for wear around camp, and a pair I used only when I’m settled in the tent. But the day before, my camp socks had been so miserably wet and icy, I stepped outside wearing my tent socks and my soggy tennis shoes drenched them. The air was too cold and too humid to evaporate moisture; I resigned to my chilled and clammy state. We went on like this for three days as the storm hovered over us. We had run out of books to read and had talked about everything under the cloud-blindered sun. We even wondered aloud why we hadn’t quit the trip even though it had been the least fun I have had in a long time. We decided that if we could just hang in for a month or so, things would get better, and we’d be able to carry on for the entire 1,200-mile circumnavigation of the lake. Early in June, we forged along through the chilly weather. 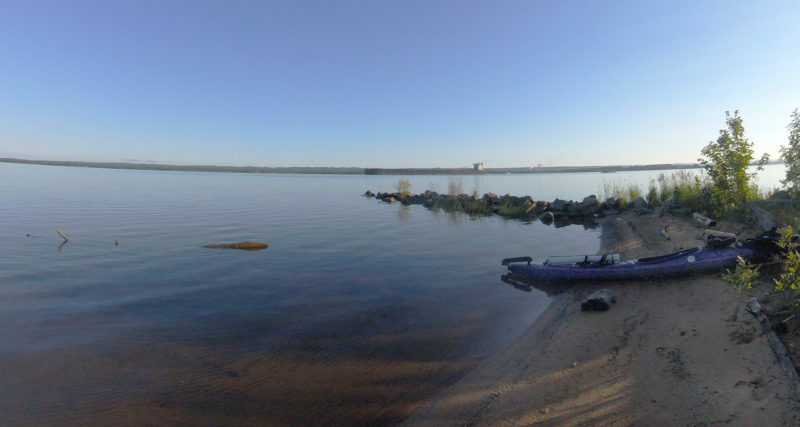 Leaving Wisconsin’s familiar, muddy ledges behind, we spent a harrowing day paddling past Duluth’s dozens of miles freeway-lined shore. By the time we settled into Minnesota’s North Shore, the wild storms of the late spring had given way to kinder days. A day or two before reaching the northern outpost of Grand Marais, we slept easily in the crisp cold of a clear star-speckled sky. We woke at 5 a.m. to the beep of my watch alarm and before I pressed the button to turn it off, Sophie was already out of her sleeping bag and stuffing it into its compression sack. The long, loud hiss of air by my ear as she rolled and deflated her sleeping pad drove me out of my bed. At nightfall on a cold Minnesota evening, we ate dinner while gazing across the lake at an ever-so-faint strip of land that was the Wisconsin shore we’d been traversing a week ago. In 20 minutes’ time we had packed our boats in exactly the way we did each morning. Every space inside my hatches was tightly packed with gear. A large nylon bag held neoprene gloves, sunscreen, and a woolen hat was attached to my front deck. On my stern deck a large Pelican case kept our camera safe, and a 3′ PVC tube strapped across my rear hatch cover held the rolled maps for the lake’s whole coast. By 6 a.m. we were slipping across exceptionally glassy water, paddling in silence. The water felt frictionless. The shore was lined with cliffs, with homes perched on the ledges high above the water. At this hour, yards and decks were quiet, and there was no one to be seen. After an hour an intermittent breeze dragged dark patches across the silvery water. Soph and I were reluctant to break the silence, and kept to our routine of paddling fastest before taking our first snack break. Massive, decadent homes—some surrounded by well-appointed lawns, hedges, and flower gardens, others nestled deep into the trees—dotted the shore, and while they were separated by enough land to give their residents privacy, there was nowhere we could get off the water without stepping in someone’s yard. We found one strip of beach along Highway 61 and paddled ashore for a break. We had our lunch on a park beach that was crawling with picnickers. There was no outhouse and I hadn’t found anywhere to duck out of sight, so by the time we got back to the kayaks I was doing a little bathroom jig. The wind picked up, as it almost always did right after noon. It had become customary for us to get off the water by 2 p.m., and by 1 p.m. it was already clear we wouldn’t making much headway, so we began looking for a beach to hide ourselves away. After an hour of searching we rounded a steep point of land ragged with fissured rocks and found a little beach pushed up against between a 50’ sheer cliff and an equally high, steep wooded hill. It was the first spot with no vacation home in sight. While Soph held the kayaks, I scampered into the woods to relieve myself. After we carried our heavily loaded boats out of waves’ reach, I explored the crevices and overhangs under the cliff. Sophie scoped out the shore in the opposite direction. We paddled into a quiet evening in the calm after the storm. The sunset against a speckled sky took our breath away as we drifted toward Grand Marais, Minnestota, to resupply. The distant, lumpy landscape casts a contemplative spell as we prepare for the rugged Canadian portion of our journey. “Oh crap! There’s a staircase!” Sophie’s voice came from around the corner on the side of the beach backed against the wooded slope. I joined her at the base of the wooded slope and saw in dismay a steep, wooden staircase, nearly ladder-like, climbing up the slope. These treacherous staircases are common on the north shore where people build on properties looking out over the lake. Storms pound these stairs in the winter, and we had seen many smashed staircases splintered on the beach. Sophie and I climbed the stairs to ask permission to camp on the beach. A climb that had us breathless led us to a striking modern house, hidden in the pines. It was built almost entirely of glass, and inside we saw tables and ceiling beams clearly made from reclaimed wood, sprawling marble countertops, and sculptural Scandinavian furniture. As we peered in to admire the deluxe interior, I noticed a squirrel perched on his hind legs on the deck staring in with us. With my wild hair and stinky armpits, I felt as if I were just another curious animal. Sophie and I checked the other side of the house and discovering faint tracks in a crushed gravel driveway. The residents were likely weekenders only, but to be on the safe side I left a note sharing the details of our journey and thanking them in advance for the privilege of spending the night on their beach. We descended back to the lake level and began unpacking. From the after compartment I pulled out our 2-quart Dutch oven—still crusted with last night’s devil’s food cake—the hard little ball of my compressed sleeping bag, and the tent poles. I slid each arm through the handle-loops of a few dry bags, hooked fingers on a Nalgene-bottle loop and stuff-bag strings, and trudged up the rocky shore, placing each step with care to find solid footing. Sophie and I liked the challenge of carrying all of gear from the kayaks in a single load. Halfway up the beach, the bags on my left side start sliding off. I lifted my left arm and rushed toward the campsite, moving as fast as I could while battling to keep my hold on the pieces of gear piled on and hanging off my body. After setting up camp, we kept out of sight in the woods until darkness, hoping that the homeowners wouldn’t come home and decide to walk down to the beach. Like many nights on this populated stretch, I never quite settled into a deep sleep during the night, waiting for morning to get away before our trespassing was noticed. We left Minnesota behind on a humid, overcast day, and paddled up the Pigeon River, a muddy meander that separates Minnesota from Western Ontario’s inconspicuously similar wooded border. We made a short hike up to the highway, had our passports scanned, and carried on to the Canadian part of the trip. My rugged kayak rested on the rocks at the only accessible stopping place during this late afternoon paddling along wild St. Ignace Island’s southwestern side. Spindly pines, lichen-spattered basalt, and clean, clear water were the norm in the north reaches of the lake. “Sorry, Sophie! I broke the rule again!” Sophie paddled ahead of me and, intently focused on keeping her momentum against the gusts, ignored my apology. We both knew this wind was my fault. It came in walls, and ragged chop broke just over my kayak’s bow. Desperate for a moment’s rest, I set my paddle shaft across the pool of water sloshing across my spray skirt and leaned forward to steal a drink from the water reservoir on my deck. A solid gust caught the blades of my paddle and thrust the shaft against my gut and the swallow of water went right down my windpipe. I hacked it up with a few wracking coughs, and in those few seconds, I’d been pushed backward at least 15 yards. Sophie, a full 100 yards down shore, gestured emphatically toward a rock the size of a modest RV and whitewashed with guano. It looked like the only possibility to tuck into a lee and regroup. 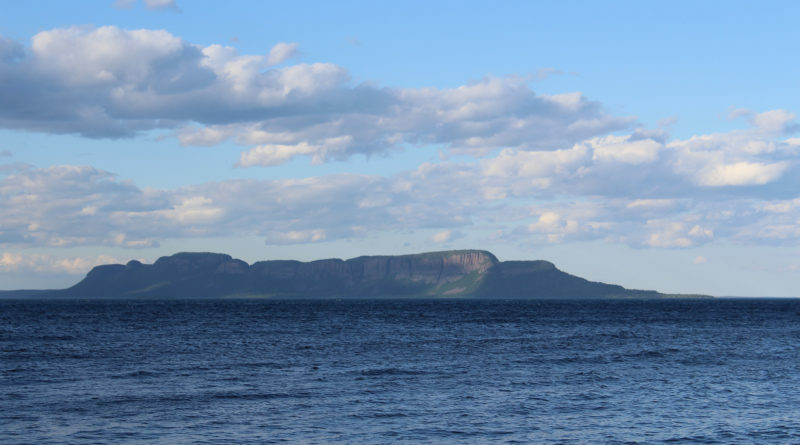 We spent days sitting on the Canadian Pie Island waiting to do the 6-mile crossing of Thunder Bay to the majestic Sleeping Giant. It is said that that the formation looks like a giant sleeping on its back. Looking from right to left, we could see the outline of a head, followed by shoulders, down to a hip, bent knees, and feet. The formation rises over 1,800’ high, and even across 6 miles of water it is an imposing figure. I strained toward it. The waves were pushing higher, lapping at the horizon and often obliterating Sophie from sight. With the passing of each peak, I sucked in a breath for the dizzying roller-coaster drop into the trough. 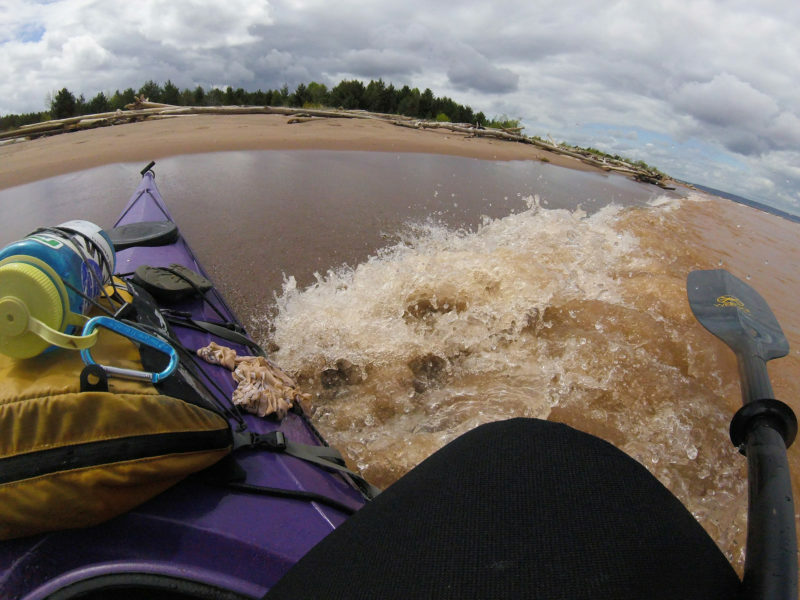 Each of the steep-sided crests held my kayak in a moment of teeter-totter equilibrium with the ends suspended in the air before my bow smacked down with a force that vibrated through my legs and shot spray up into my face. When I reached the lee of the seagull-infested rock, the air was still but rank. On its windward side, the rock’s height stood 10’ above the water, with a sheer vertical face standing bold against the wind. Its leeward side pitched downward to the nearly flat shelf of rock which ended in a gentle slope into the water. Protected from the wind, I dragged my nearly swamped kayak ashore and plopped down on an ottoman-like rock next to Sophie. Bursts of wind cresting over the top of the windward side of the rock just skimmed the top of my head, tugging at locks of hair. “When will you learn?” she sighed. If the old mariner’s superstition about commenting about fine weather is true, I was to blame for the wind we had been struggling against. We’d had three days in a row of nearly tropical weather on Lake Superior with only a gentle breeze, just enough to cut the heat from a blazing sun unimpeded by clouds. The still water was unclouded and rocks 50’ beneath us radiated kaleidoscopic color. Ripples lapped against round basketball-sized cobbles piled on steep slopes. 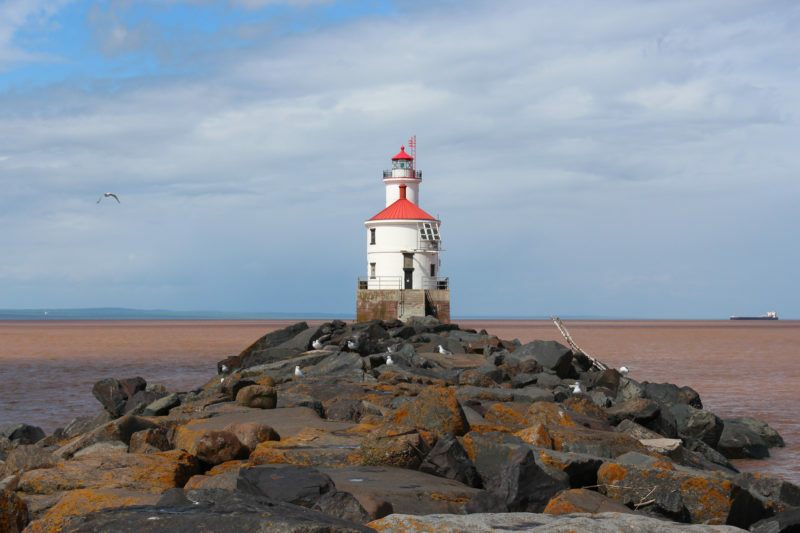 Those rocks at the water’s edge were milky white, speckled in gray, and black. Higher up pumpkin-colored lichen dotted the stones. We’d had a few days like this; it was easy to forget that headwinds, rain, and storms were possible; and soon after I had commented on the fair weather, “Well, this is just about as amazing as it could get.” What had been a light breeze became a stiff wind and the summer haze blurring the horizon turned into a thick slate-gray roll of clouds. Cooking and eating good food allowed us to settle into life along the lake’s perimeter rather than hold our breath until it was over. 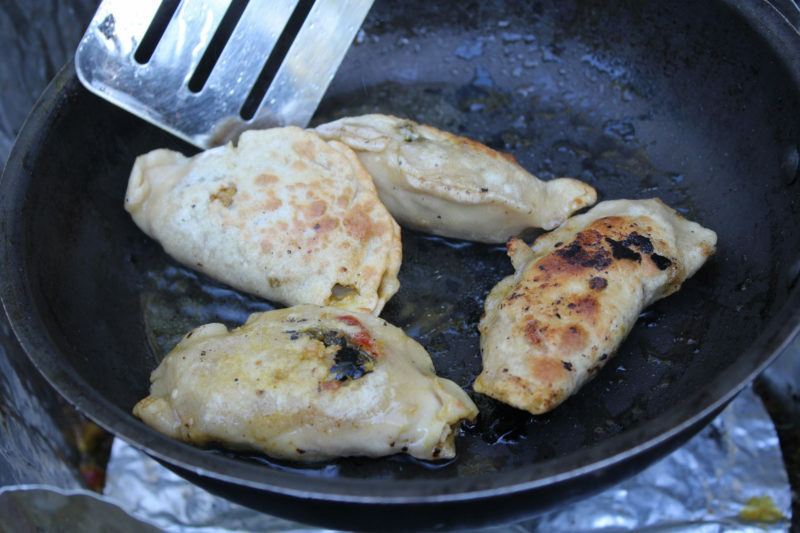 We mixed warm water and flour to create thin dumpling wrappers, which we filled with spiced and sauced mixed vegetables and textured vegetable protein. We didn’t hold back on the oil. The rock Sophie and I were sitting on lay at the midpoint of the mile-wide opening to a horseshoe-shaped bay. A quarter mile away, the spindly spruce and fir trees lining the bay were tightly huddled together in a forbidding palisade. The spaces between tree trunks would be too small to walk through let alone set up a tent. We’d have to land on the cobblestone beach that lay downwind of us and find a place to make camp. A wall of billowy thunderheads charged toward us; it was time to make a dash to shore and hunker down. Superior was showing her wild side while we weathered a fantastic storm on Simpson Island. 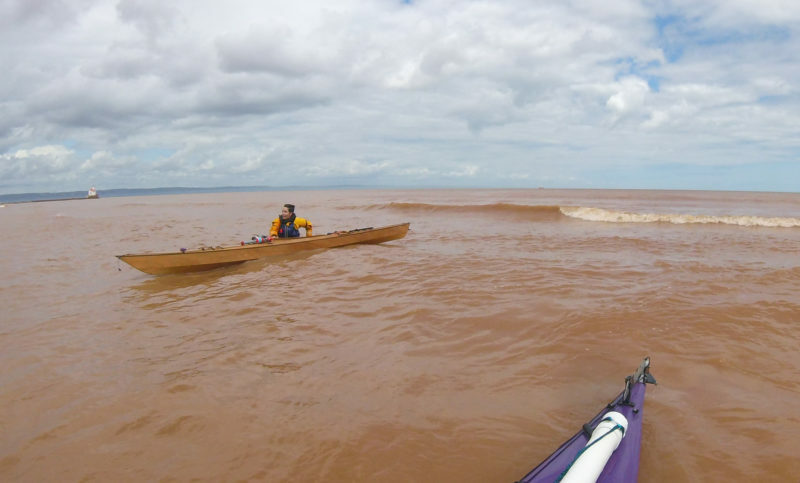 With the wind and waves at our backs we made good speed surfing toward shore, even though we did as much work bracing to avoid broaching as we had while paddling. But reaching the beach buried in the bay appeared to be easy compared to the landing that was ahead. Soph and I perched 40′ offshore. About every four seconds a tall wave pounded the line of imposing rocks, washed up the beach, and receded. The thump of water on rock reverberated in my chest. I tried to coordinate the best landing procedure with Sophie, but the wind carried my words away. I shouted that I would go in first and then catch her as she approached. Swallowing my fear, I rode swells in, sharply inhaling each time they lifted my stern above my head. I landed with a thump on the rocks, bolted out of the cockpit, and dragged the kayak up the shore, a 40′ slope that resembled a rock slide. 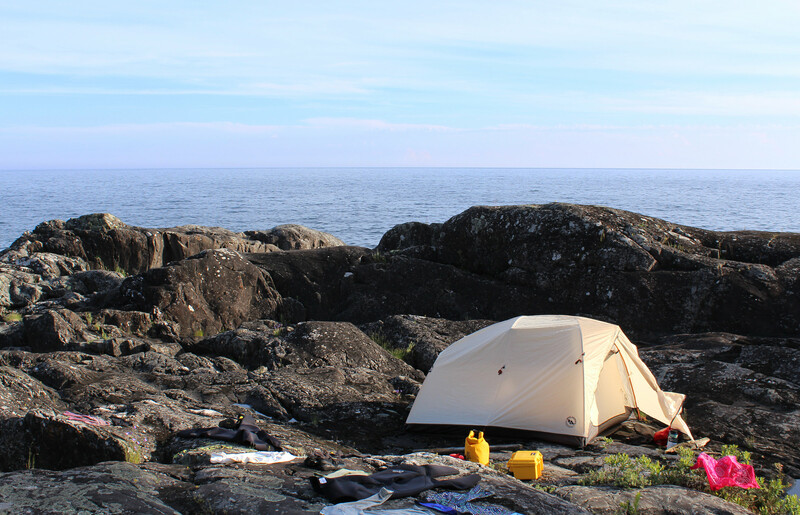 We spent a night perched on an uneven rock plateau high above the water in Pukaskwa Provincial Park. With no beaches in sight we had clambered up the vertical and jagged rock pile. After passing items up one by one then slowly lifting empty boats up upon the rock, we pitched our tent on the least lumpy patch of rock. I rushed back into the breaking waves. Chest-deep in froth, I felt my legs squeezed by the water. I gave Sophie two thumbs in the air. She reached forward with her paddle and surged forward. A wave hurled her straight for me and I darted to the right, threw myself over her front hatch. I grabbed her deck lines. While I steadied the kayak, she popped her spray skirt, and hopped out. Together we carried her kayak up the ankle-breaking cobbles. With both boats safe from the waves, we climbed up the hill to scout a place for the night, and perhaps for a few days to come. I hopped from rock to rock, ever ready for those that might roll underfoot and make me fall. Tearing a ligament or cracking a bone would end the trip. At the top a nearly level plateau, lichen-splattered rocks spanned a few dozen yards to a forest of spindly trees. We made our kitchen in a spot with juniper bushes to shield us from the wind and a few trees to support a tarp over our heads. A few dozen yards from the kitchen, we found a patch of rocky ground for the tent. While I was stretching the kitchen tarp tight, Sophie began setting up the tent. Moments later she yelled, “The tent’s got me!” The wind had wrapped it flapping around her head and torso and then picked up the fly and sent it tumbling like a plastic bag blown down a city street. I ran after it and snagged it before it got away. I got Sophie untangled and the two of us got it set up. There was little sand or soil for staking it down, so we collected a few heavy rocks and tied the tent’s corners to them. With the wind now gusting at 30 knots, we took shelter under the wildly flapping tarp over the kitchen and hurriedly prepared a dinner of dried vegetable alphabet soup. Eager to escape the violence of the storm, we ate quickly and tightly wrapped our food bags and cooking equipment in a tarp and weighted the bundle down with rocks. Sophie ran for the tent ahead of me, and we plopped down on the hard, lumpy tent floor. Goofing around in our little tent, we laughed until bedtime rolled around at 7:30 p.m., well before the sunset. 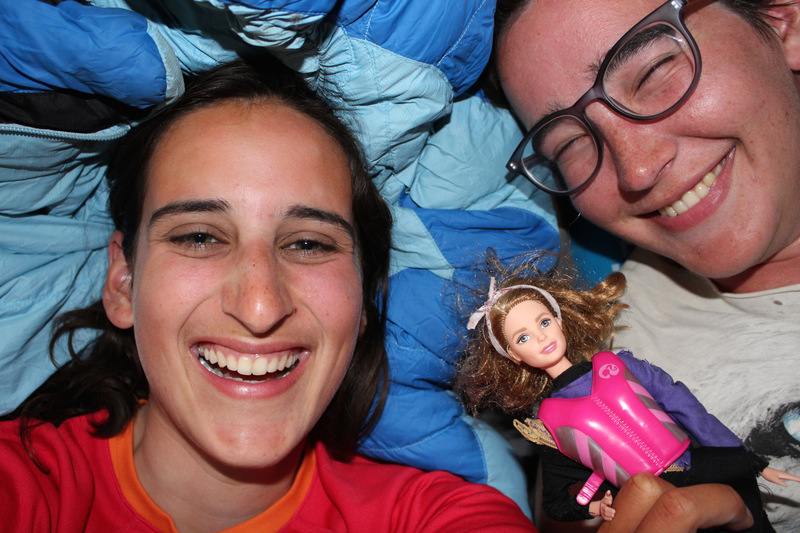 We were joined by Kayaking Barbie, given to us by a dear kayaking friend. Though she could not join us, her Barbie, with plastic kayak, was with us the whole trip, sometimes shoved far up a bow hatch, sometimes bungeed proudly on a foredeck. Over our heads, the dome of the tent was pressed sideways by the wind, and its wall edged toward Sophie’s head. Seeing the fabric quivering violently over her face I her I started to giggle; Sophie rolled over, laughing into the tent floor. When we listened to the weather report on the radio, we heard: “Severe storm alert. Mariners seek cover. Squall warning. Winds gusting 45 to 55 knots.” We nestled into our sleeping bags and I spent the night drifting toward sleep, only to have cracks of thunder send adrenaline surging through me. 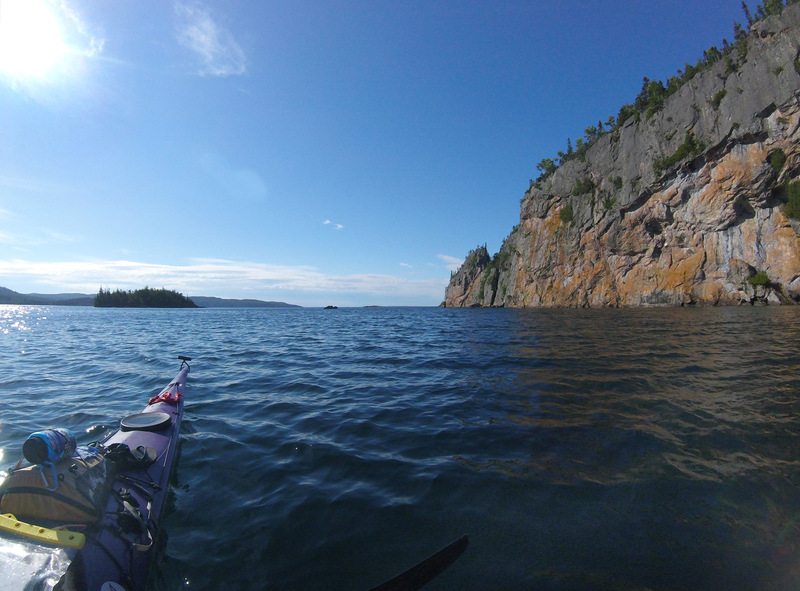 On a sunny bluebird day, the cliffs in in Ontario’s Lake Superior Provincial Park towered over Old Woman Bay. Gentle swells lapped at the wall of rock, making a rhythmic thunking sound. 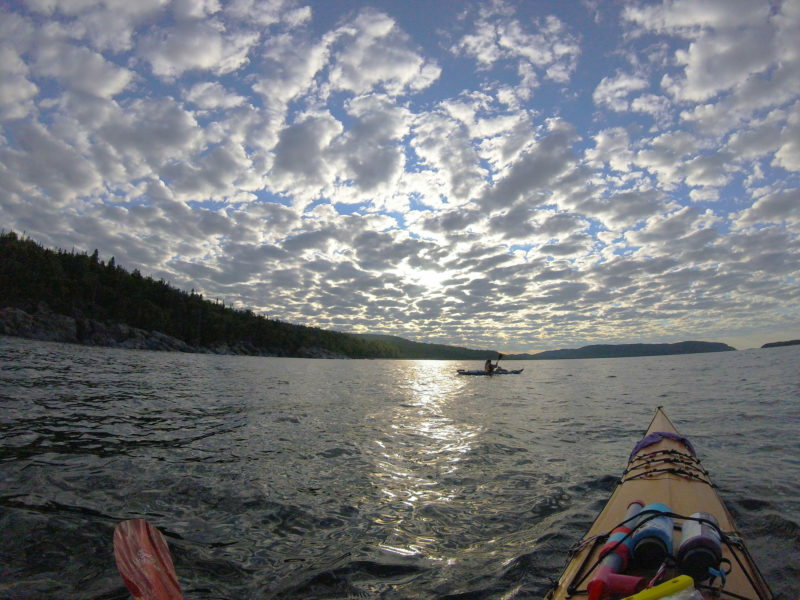 “Screw it,” Sophie said, “we’re going.” We packed in the dim predawn light and were back on the water, underway again, spooling miles along the Lake Superior coast. As the summer days ticked by, Sophie and I grew stronger. When the weather would allow, we’d do 30-mile days. The small, widely spaced communities and uncertainty of finding nutritious dried food at their stores meant we had to carry two to three weeks’ worth of food in our boats. With heightened metabolisms, our food disappeared quickly. With full bellies and ever lightening boats, we took advantage of the warm winds and made quick time back to the American border. We made a sunrise departure along the St. Marys River, eager to leave gritty Sault Ste. Marie, just a few miles east, in our wake. We rounded the corner at Sault Ste. Marie, crossing back into the U.S., and suddenly our months of traveling east into the morning sun were behind us. It was late July now, the weather had become hot, and the prevailing westward wind had begun, blowing into our faces all day long. The landscape had changed too, from sheer rock cliffs to endless sand dunes. The gentle slopes of the beaches were so gentle that we spent all day paddling 50′ offshore, floating above endless rippled sand with only inches of water between my rudder and the bottom. Mild wind in these extensive shallows meant dumping surf nearly every day and for the first time, our landings and launchings were determined by how manageable the shore break was. We stopped to eat lunch while watching a lazy August storm roll by. An unusual layer of pebbles covered the hardened sand on this beach that has extended, uninterrupted, from Crisp Point Light on the Upper Peninsula of Michigan for days of paddling. 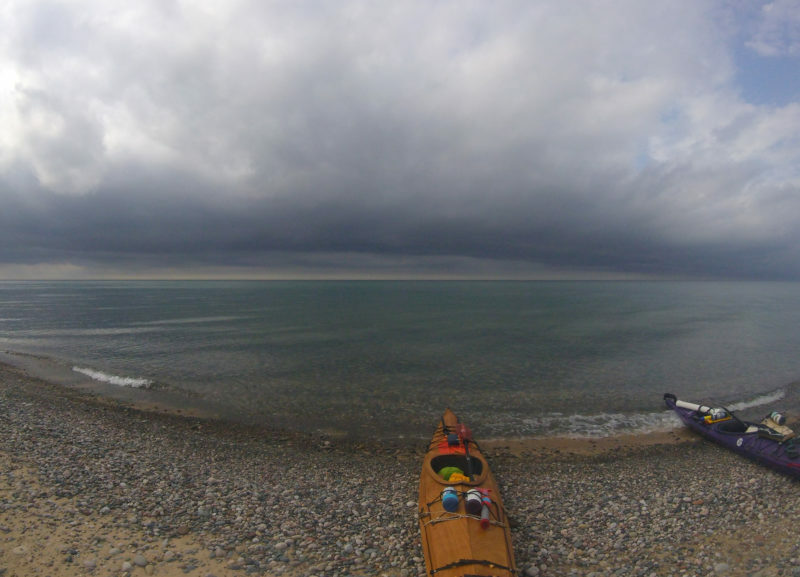 After we had rounded Whitefish Point, a dagger of land pressed into Lake Superior’s eastern neck, and we paddled far out from land where lurching rollers pushed us forward. In the morning, we had come ashore at Whitefish Point Lighthouse, making our first human contact in a week, and a few miles farther on decided we needed to stop for lunch. We assessed the miles of beach ahead. The beach ran as a 50’ flat before rising sharply into a grassy dune-wall that climbed steeply 30′ to what looked like open, sunny woods full of towering pines. Sophie cooked a sumptuous lunch of blueberry pancakes on our blissful “vacation” day on the Upper Peninsula of Michigan. Although she has scabs on her legs and sunburnt patches on her neck, she has a smile on her face. I am usually the more conservative paddler, and conditions I would describe as gut-wrenching, Sophie calls a good time. Pleased by my unusually gung-ho attitude, she agreed and we approached our landing. It was fine until a few boat lengths from shore and my stern was kicked high and my bow was plowing into the sand. I ripped my spray skirt off the coaming, shimmied out of the cockpit, and rolled my body tightly out the side, landing hard on the sand beneath the swirling foam. I leapt up and hauled my boat to dry ground. So, I guess we are sleeping here, huh?” Neither of us would dare venture back into that surf to leave anytime soon. Sophie, sitting on the sand, only grunted in reply, clearly hangry and annoyed by our circumstances. I set her up with a bag of pecans and raisins, and trudged up the high dune to scout the woods above. As the sun set on our “vacation” day, the boats took a well-deserved rest. The surf that marooned us here had calmed down for the evening and stayed that way through the twilight hour. This was what we had come to know as the evening lull—a time each day when the lake seems to relax, the tension eases, and waves begin to lap, rather than slap, the shore. Tall pines with sparse branches stood dozens of feet above me toward the sky, and the hard-packed sandy forest floor was carpeted with umber needles and dappled with sunlight. A broad open space was covered with low scrubby bush. Jackpot. 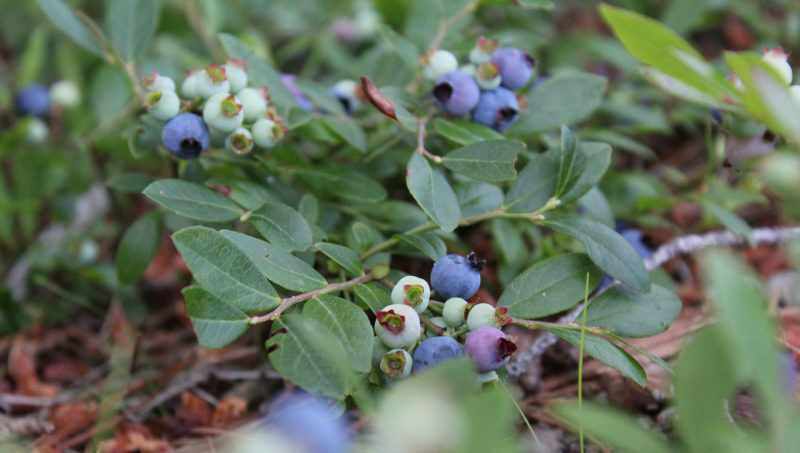 Under each leaf hung clusters of dark little wild blueberries. Deeper in the forest I found fields of blueberry bushes. I sprinted back toward the lake, vaulted over the dune ledge, and tumbled down through the sand to tell Sophie about our home for the night. All along the Michigan shore, these little blue zingers abounded. We ate them by the handful and made blueberry pancakes, blueberry scones, blueberry crumble, blueberry bread, blueberry cake, blueberry jam, and blueberry granola. Sophie and I shuttled all of our gear up the dune-ledge, kayaks included, and set up our tent on a patch of bare ground nestled among blueberry bushes. I hoped that any bear in the area would find plenty of berries to eat without having to harvest those near us. Sitting by the edge of the bluff looking out over lapis lake waters, we made a lunch of blueberry-packed pancakes fried in butter. 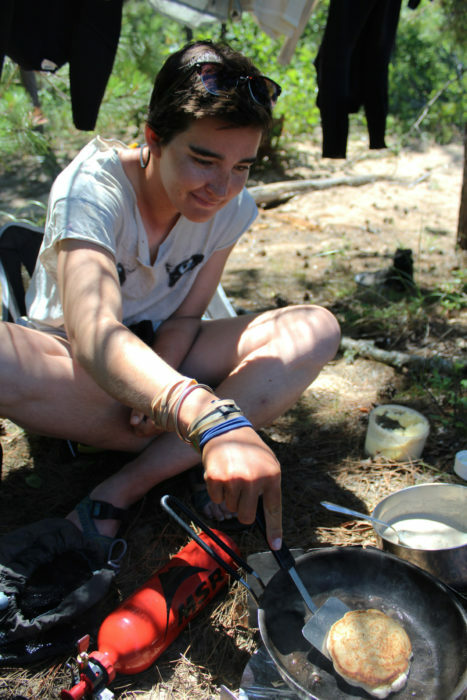 Under a cloudless sunny sky, cooled by a steady west wind, we lazily cleaned our plates and put a pot over our leftovers on the camp stove to fend off nosy chipmunks. I put on my wetsuit and Sophie retrieved a book before heading down to the beach. She sat down, curled her toes in the sand, and opened her book to read. As I headed to the water to play in the surf, she called after me, “Go easy or you’ll get a cramp!” For these three months, we had been each other’s family. We were best friends, sisters, and parents to each other. When we returned to our camp, I tied my hammock between two broad-canopied pines, climbed in, and lost myself in a Barbara Kingsolver novel while the wind rocked my nest. Sophie disappeared into the blueberry bushes, re-emerging nearly an hour later with our dented tin pot full of blueberries. She set herself up in our kitchen, and with her sun-cracked hands, kneaded together chunks of butter, flour, oats, some baking powder, and sugar until she had a soft, sticky mound of dough. As she folded in the tart berries, the dough became streaked with purple berry juice. Together we baked the scones in the Dutch oven over a little fire. 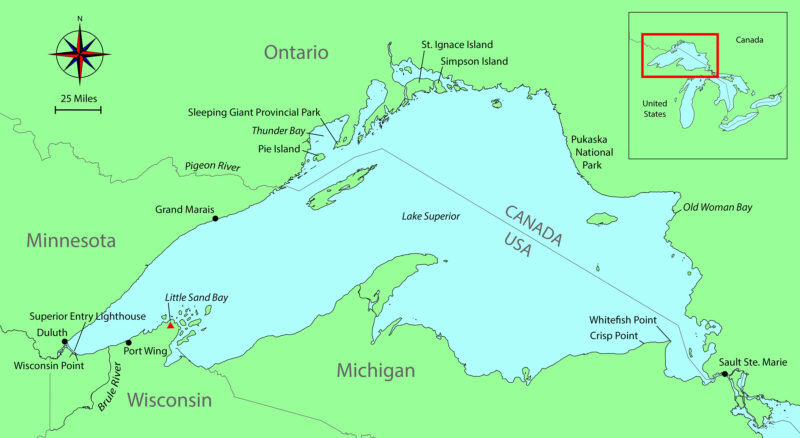 In about two weeks, we would return to where we started, Little Sand Bay, completing an 86-day, 1,200-mile circumnavigation of Lake Superior. We’d leave this camp behind, but we’d have a lifetime to savor the memory of sharing sweet, fresh-baked scones at the edge of a lake that spans the horizon. Uma Blanchard is a guidance counselor who works with high-achieving teens who will be the first in their family to go to college. 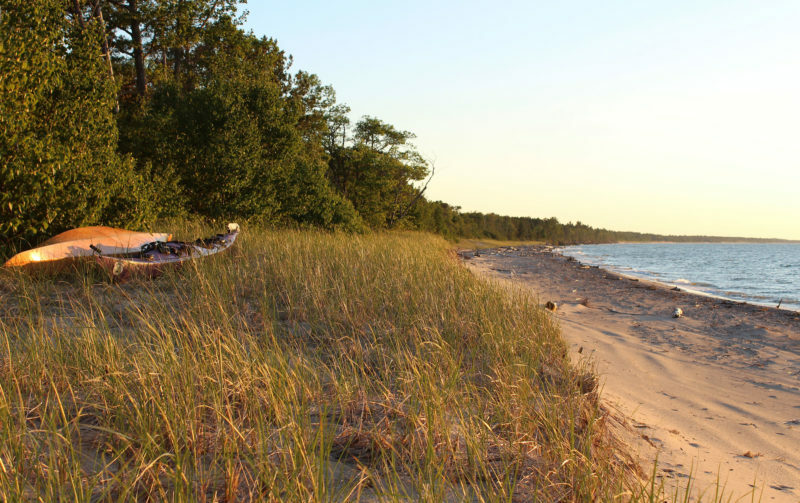 As a Chicago resident, Lake Michigan is Uma’s new playground and she spends her weekends either teaching kayaking classes or out and about on her own Midwestern outdoor adventures. 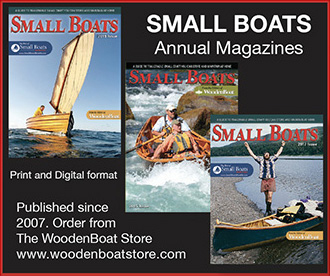 She is longing for the day when she has a garage, and is able to begin amassing a healthy collection of boats. Sophie Goeks is a second-semester senior at Northern Michigan University, where she studies mathematics. She is spending her free time admiring the ice on Lake Superior and dreaming of new adventures when the weather warms. She hopes to spend some quality time in the Boundary Waters this coming summer, breaking in the canoe she is currently building. A cure for stinky pits: merino-wool underwear, at least under a dry suit. Don’t think it would do any good with a wetsuit though. REI has it. Beautiful article!! Great writing and a great trip. Thank you so much for sharing with us! I am so envious. I really want to do a similar trip in my Ironblood beach cruiser. Great story, I wish I could have been with you. What an amazing story! Truly inspiring. Thank you. Great article. 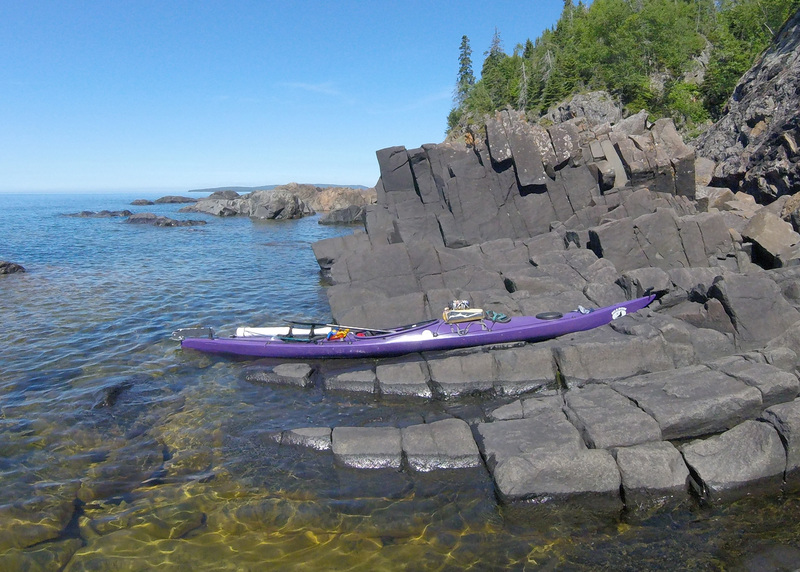 For a smaller taste of the same type of adventure circumnavigating Isle Royale is a blast. If you are kayaking later in the season, the thimbleberries are even better than the blueberries!